There’s kindness in every card. Let’s get the wave started! You have come to the right place to spread kindness. We can help with that. 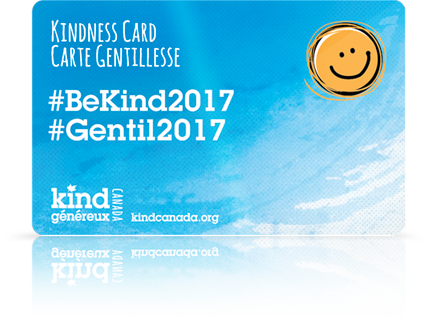 We have Kindness Cards for sale. Our goal is for every Canadian to take the pledge. Let's all make a commitment to be kind. Canada is a kind country, fourth in the world according to the World Giving Index , which measures donating to a charity, volunteering and helping a stranger. We believe that genuine kindness is inherent in everyone, and is ready to be given and received every day. The practice of kindness requires no special course or training and it takes very little time. Kindness is a natural state within you to uncover. Realizing this and making it present for yourself is all that is required. Copyright © 2019 Kind Canada Généreux. All Rights Reserved.